East Calder is a village that stands two miles east Livingston and a mile east of its neighbour and near namesake, Mid Calder. The two Calders are prevented from merging by a strip of open countryside that runs along the line of the valley of the Linhouse Water. 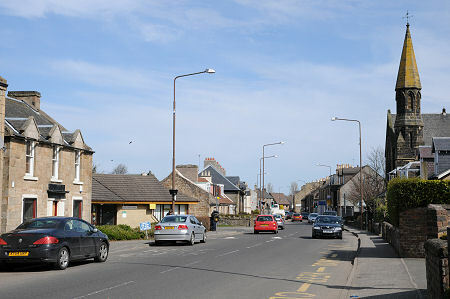 The B7015 passes through the centre of East Calder twisting and turning as it does so. Until 1981 when both Calders were bypassed to the south by the A71, the road through them formed part of the main route from Edinburgh to Lanark. As you try to negotiate your way through a village in which parked cars often prevent two way traffic from flowing, it is a sobering thought that without the bypass, this would be an even busier place. 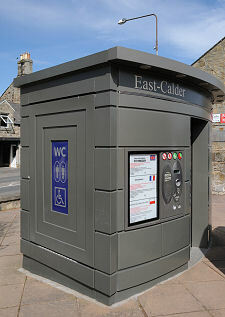 The centre of East Calder remains fairly tightly confined by the proximity of the valley of the River Almond to the north. Today this forms part of the Almondell and Calderwood Country Park, a linear country park that follows the river valley. Development has been possible to the south and east, however. As a result residential development has been extensive between the core of the village and the bypass, and it is here that you also find the leisure centre. 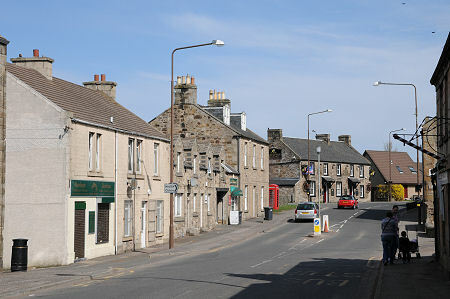 The main road is home to most other village facilities, including two pubs, a library, various shops, and a bookmakers. 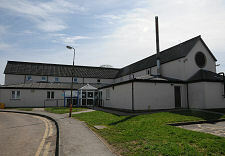 Just off it is a recreation ground and a health centre. Built in 1982 this has been described by one architectural reference as a "cathedral to health in agricultural barn aesthetic". It is unclear what the author of that description would make of the more recently arrived superloo that stands nearby. On the south side of the main street is the Parish Church, built in 1888. Its arrival made the old church, St Cuthbert's, redundant. The earlier church had been built in the 1500s and still stands, roofless, towards the west end of the village on the north side of the main street. The churchyard is not as fruitful a mine as you might hope for old gravestones, but there are a few interesting ones on view. East of East Calder is Camps Industrial Estate, whose name is interesting though the exact origin of it is difficult to pin down. Further east again, close to the junction between the B7015 and the A71 is Bonnington House, whose grounds are home to a contemporary sculpture garden known as Jupiter Artland.